President Bush and Russian President Vladimir Putin on Saturday urged Iran and North Korea to abandon suspected nuclear-weapons programs, but disagreed over how to deal with both countries. Putin also declined to pledge any postwar help for Iraq. Putin said any Russian contribution to Iraq's reconstruction would depend on a U.N. resolution sought by the United States to encourage other countries to offer money and peacekeeping troops. Along with France and Germany, Russia is demanding a greater role for the United Nations in Iraq and a speedier timetable for ending the U.S. occupation. Despite their differences, Mr. Bush and Putin stressed their personal friendship and the great strides in U.S.-Russian relations since the Cold War. "I like him. He's a good fellow to spend quality time with," Mr. Bush said, standing in the warm sun of Camp David after two days of talks. CBS News Correspondent Mark Knoller noted that, "The two leaders called each other by their first names and said they hope to bring the relationship between their nations to a new level of partnership." "American-Russian summits sometimes result in very important breakthroughs in world affairs," said CBS News Russia Consultant Stephen Cohen. "This one was decorative. Nothing of fundamental importance occurred. 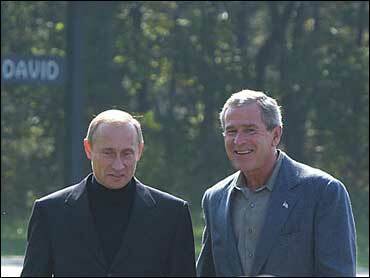 President Bush did not get – in regard to Iraq or Iran - what he hoped to get from President Putin." The invitation to the presidential retreat in Maryland's Catoctin Mountains was intended to underscore their close ties, after meetings earlier during Mr. Bush's administration at the White House and the president's ranch in Texas. Their show of harmony notwithstanding, Putin gave no indication he was willing to pull back from an $800 million deal to build a power plant in southern Iran. Mr. Bush has pressed Putin for two years to abandon the project, and the International Atomic Energy Agency said last week it had found new evidence that Iran is enriching uranium. Putin said Russia would "give a clear but respectful signal to Iran about the necessity to continue and expand its cooperation" with international inspectors. He said Russia "has no desire and no plans to contribute in any way to the development of weapons of mass destruction, either in Iran or any other country in the world." Emphasizing agreement, Mr. Bush said, "We share a goal and that is to make sure Iran doesn't have a nuclear weapon, or a nuclear weapons program." Putin made no concessions on Iran in private, either, a senior administration official said on condition of anonymity. But the official said the Russians' willingness to nudge Iran toward IAEA cooperation is part of a pattern of small steps toward progress. Mr. Bush said the United States and Russia jointly urged North Korea to "completely, verifiably and irreversibly end its nuclear programs." But, again, there was disagreement. Putin said that in exchange for North Korea's dismantling of its nuclear program, the United States should give the communist country a guarantee of its security. Mr. Bush has been unwilling to make that concession. Mr. Bush and Putin did not mask their differences on Iraq, and the Russian leader hedged any offer of postwar help on the outcome of the U.N. resolution being negotiated. "We had differences over Iraq in terms of the practical way of how to resolve this problem," Putin said. "But we had understanding on the essence of the problem." As for reconstruction help, Putin said, "The degree and the extent and the level of Russian participation ... will be determined after we see the resolution." While Putin insisted that the transition to Iraqi self-rule happen "as soon as possible," he pleased Mr. Bush by acknowledging the American position - that Iraqis need time to build the necessary institutions. The process "should go ahead stage by stage," Putin said. Mr. Bush declared himself happy with cooperation from other countries, even though he came away empty-handed from two days of diplomatic talks last week in New York. The United States hopes to assemble an international division of 10,000 to 15,000 peacekeeping troops from India, Pakistan, Turkey, South Korea and other countries. Mr. Bush said that he and Putin had "some very frank discussions about Iraq." The Russian president strongly opposed the war and has said that the turbulent aftermath proves he was right. "Because we've got a trustworthy relationship, we're able to move beyond any disagreement over a single issue," Mr. Bush said. In his weekly radio address Saturday, Mr. Bush urged all countries to help Iraq. "All nations must join in confronting this threat where it arises, before the terrorists can inflict even greater harm and suffering," he said. Mr. Bush gave Putin support on his crackdown in Chechnya, a sensitive issue for the Russia because of international criticism about alleged human rights violations. Russia and the United States have been targets of terrorists, Mr. Bush said. "No cause justifies terror," Mr. Bush added. "Terrorists must be opposed wherever they spread chaos and destruction, including Chechnya." But Mr. Bush went on to say, "A lasting solution to that conflict will require an end to terror, respect for human rights and a political settlement that leads to free and fair elections." Mr. Bush also defended tough U.S. visa policies that Putin complained were impeding legitimate travel by journalists, business people, artists and educators. "Our intention is not to slow down visits," Mr. Bush said. "Our intention is to make sure that visitors who come are reasonable people" and not terrorists. He said the system was still be worked out. Efforts to increase cooperation on affordable housing, banking reform and foreign investment in Russia and on Russia's rising oil exports won praise.